Click here to open a PDF of the flyer for download. 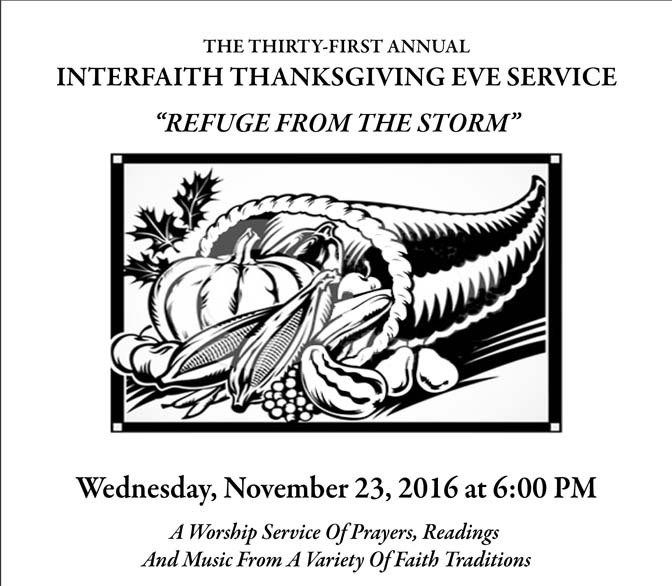 The 31st Annual Interfaith Thanksgiving Eve Service, “Refuge from the Storm,” will be held on Wednesday, November 23, 2016 at 6:00 p.m. It is a worship service of prayers, readings and music from a variety of Faith traditions sponsored by the Nevada Clergy Association. This year’s event is graciously hosted by: Trinity Episcopal Church, 200 Island Avenue, Reno, NV 89501. Monetary and food donations will go to Northern Nevada International Center – Refugee Resettlement Account. This event is a much-revered tradition in our local community and one that is largely unique nationwide in its scope of faith diversity—something to be very proud of. The last five previous hosts were: St. Therese Church of the Little Flower (2014), The Church of Jesus Christ of Latter-day Saints (2013), St. Thomas Aquinas Catholic Cathedral (2012), St. John’s Presbyterian Church (2011), Trinity Episcopal Church (2010). For information call 775-786-1800 or email [email protected].